We cruised up Long Sound to an anchorage off New Haven CT called Morris Cove. We spent a quiet couple of days at anchor. On the Saturday morning started lifting the anchor when the windlass broke down. We tried recovering it by hand, got the chain in but couldn’t get the anchor off the bottom. Put the chain back out and spent the rest of the weekend pulling the top part of the windlass apart, cleaning, greasing and re-assembling. On Monday morning it proved no better. Spent the day ringing round the hydraulics and windlass people but with no luck. Rang a local engineering firm and they brought out a length of pipe. We used the pipe on the clutch bar of the windlass and hand wound the anchor up. 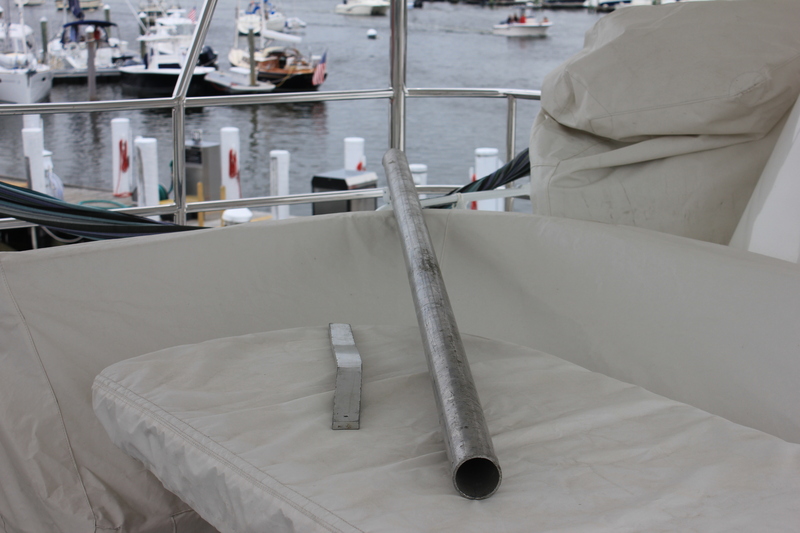 Here is the clutch bar and the pipe – a $500 piece of pipe! Both of us were goofed, but the anchor was up and we set off.